Collie eye anomaly is a disorder marked by the incomplete development of the eye. The disorder is found in rough and smooth collies of all colors worldwide. This defect can manifest through underdevelopment of the choroid (choroidal hypoplasia), a defect of the optic nerve or adjacent areas (coloboma), an area of thinning in the sclera (staphyloma) and retinal detachment. While the severity of the anomaly ranges from no apparent visual defect to total blindness, most Collies with CEA do not demonstrate vision problems. CEA is a recessive defect, which means that an animal must inherit one copy of the abnormal gene from each parent to be affected by this disorder. Affected dogs are termed homozygous dogs. If a normal Collie (no CEA genes) mates with a carrier dog (a dog that has only one copy of the CEA gene or a heterozygous dog) but shows no external signs of the disease the resulting puppies may also be unaffected but may pass the abnormal gene along to their respective litters. Carriers cannot be distinguished from normal dogs based on an ophthalmic examination alone, and should be genetically tested before they are bred. While it is possible for one eye to have a different grade than the other eye, both eyes are affected in almost all CEA cases. Originally the hope was that by breeding Collies with eyes that are only mildly affected it would minimize the potential of producing severely affected CEA offspring. Unfortunately, this was not the case. Collies with minor eye defects can and do produce severely affected offspring. In other words, for the purpose of genetic selection, a Collie that shows even the mildest effects of CEA is just as likely as a Collie suffering serious effects to produce offspring with severe CEA defects because even midly affected dogs carry both copies of the abnormal CEA gene. Some Collies start with a Grade 1 or Grade 2 as young puppies and then “go normal” as they mature. This means that over time normal pigment grows over the area of choroidal hypoplasia masking the defect so that the eye appears normal in later examinations. These animals are abnormal genetically and can set a breeding program back years. CEA in Collies that have “gone normal” cannot be detected in an eye exam after about 12 weeks of age. While lesions stemming from CEA can be detected in puppies as early as five- to six-weeks old, we recommend evaluation at six to eight weeks of age. This age facilitates the exam and thus produces more accurate results. There is a genetic test available for CEA and more information is available on testing at www.optigen.com. Persistent Pupillary Membranes are fine strands of mesodermal tissue (from the middle embryonic layer). In the embryo, the iris is initially formed as a solid sheet of tissue. Later in development, the sheet thins in the center to form a functional hole known as the pupil. Any abnormal remaining strands of this original tissue are described as Persistent Pupillary Membranes (PPMs). It is not unusual to see such strands in six- to eight-week old puppies and unless the strands are extremely large, they are not typically a cause for concern. If pupillary membranes persist beyond this stage they are considered a defect. Persistent Pupillary Membranes can also form attachments between the cornea and the lens, resulting in permanent opacities and vision defects. Progressive Retinal Atrophy (PRA) is a collective term used to describe a variety of inherited retinal diseases in dogs. Within this category of diseases is a syndrome called rod-cone dysplasia in the Collie. Dysplasia is used to describe a condition in which tissue does not form correctly. The rods and cones are the visual cells of the eye within the retina. Collies that are clinically affected by rod-cone dysplasia exhibit night blindness as early as 12 weeks of age. This night blindness progresses to total blindness as early as one year of age. 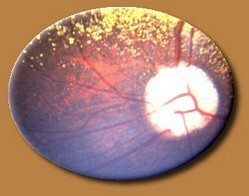 Changes can be seen in the appearance of the retina by six months of age. Like CEA, rod-cone dysplasia is a recessive defect. Collies will inherit the disease when both of their parents carry the PRA gene. The eyes of carrier dogs appear normal and show no changes in vision and reveal no signs of the disease on ophthalmic examination. To date, no test other than test breeding has been devised to detect carriers in Collies but tests are available for certain other breeds. See information on testing on www.optigen.com. Test breeding involves breeding a suspected carrier dog with a known affected dog. If the mating produces affected offspring then the suspicion is confirmed that the test dog carries the rod-cone dysplasia gene. Statistically, the more normal puppies produced by the mating the greater the assurance that the suspected dog is a non-carrier.